BANKHEAD, William Brockman, (son of John Hollis Bankhead, brother of John Hollis Bankhead 2d, and uncle of Walter Will Bankhead), a Representative from Alabama; born in Moscow, Lamar County, Ala., April 12, 1874; attended the country schools; was graduated from the University of Alabama, Tuscaloosa, 1893 and from the Georgetown University Law School at Washington, D.C., in 1895; was admitted to the bar the same year and commenced practice in Huntsville, Ala.; member of the State house of representatives in 1900 and 1901; city attorney of Huntsville, 1898-1902; moved to Jasper, Walker County, Ala., in 1905 and continued the practice of law; solicitor of the fourteenth judicial circuit of Alabama, 1910-1914; unsuccessful candidate for nomination to the Sixty-fourth Congress in 1914; elected as a Democrat to the Sixty-fifth and to the eleven succeeding Congresses (March 4, 1917-September 15, 1940); chairman, Committee on Rules (Seventy-third Congress); majority leader (Seventy-fourth Congress), Speaker of the House of Representatives (Seventy-fourth to Seventy-sixth Congresses); delegate to the Democratic National Convention in 1940; died on September 15, 1940, in Washington, D.C.; funeral services were held in the Hall of the House of Representatives; interment in Oak Hill Cemetery, Jasper, Ala.
Papers: In the Alabama Motion Picture Collection, 1914-[197-? ], 89 films. Subjects covered in the films include William B. Bankhead. An item listing of the collection is available in the repository. Papers: In the Alabama Governor's Appointment Files, 1939-1942, 6.5 cubic feet. The files include correspondence and telegrams regarding the death of William Bankhead. 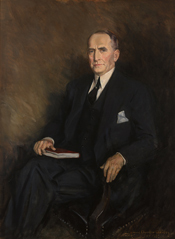 The governor, Frank Murray Dixon, called a special election to fill William Bankhead's seat in Congress. A container listing of the records is available in the repository. Papers: In the Alabama Governor's Legislative Tracking Files, 1939-1943, 2.5 cubic feet. Correspondents include William B. Bankhead. A container listing of the files is available in the repository. Papers: In the Alabama Governor's Public Relations Files, 1934-1939, 8 cubic feet. Correspondents include William B. Bankhead. A container listing for the files is available in the repository. Papers: In the John H. Bankhead papers, ca. 1865-1923, 35 cubic feet. Subjects covered in the papers include William B. Bankhead. A series description and container listing of the papers is available in the repository. Papers: In the Tallulah Bankhead papers, 1902-1968, 2.5 cubic feet. Correspondents include William B. Bankhead. A series description and container listing of the papers are available in the repository. Papers: In the Diplomas and Certificates Collection, 1801-1954, 13 cubic feet. Other authors include William B. Bankhead. Papers: In the Carter Manasco papers, 1940, 1 folder. The papers include letters of sympathy written to Carter Manasco, secretary to William B. Bankhead, following William Bankhead's death in 1940. Carter Manasco was elected to complete William Bankhead's term as a Member of Congress from Alabama. Papers: In the Marie Bankhead Owen family photographs, 1800s-1900s, 2.33 cubic feet. The collection includes photographs of William B. Bankhead. Bankhead, Tallulah. "My Life with Father." Coronet 31 (November 1951): 56-60. Heacock, Walter J. "William B. Bankhead and the New Deal." Journal of Southern History 21 (August 1955): 347-59. ------. "William Brockman Bankhead: A Biography." Ph.D. diss., University of Wisconsin, 1953. Johnson, Evans C. "John H. Bankhead 2d: Advocate of Cotton." Alabama Review 41 (January 1988): 30-58.